Because buttons and zippers hadn’t been invented yet, clothes in Anglo-Saxon England were fastened with pins or brooches. This fine silver-gilt and niello brooch is perhaps the most beautiful of all surviving great square-headed brooches. The casting reveals an artist in complete mastery of his material and current art styles. The brooch was found by George Hillier in 1855 in a woman’s grave, together with two stamped pendants, a pair of tweezers, and iron knife and a waist buckle. It was probably made in the first quarter of the sixth century. 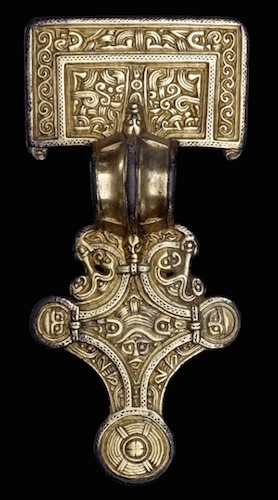 The brooch is the best example of a small group of brooches that reflect southern Scandinavian influence. Like its Scandinavian predecessors, it was cast in silver and then gilt on its front surface. The piece has close stylistic parallels with objects found in Kent, although large square-headed brooches are not typical Kentish types. The outer border of the head-plate is decorated with scrolls on the sides and two Style I quadrupeds with long ears and humanoid feet at the centre. Scrolls and disembodied Style I body parts fill the rest of the headplate field within borders of stamped and nielloed triangles. The bow is plain. The footplate below the bow is decorated with face masks in the side lobes and another larger face mask in the centre below two Style I heads. C.J. Arnold, The Anglo-Saxon cemeteries on the Isle of Wight (London, The British Museum Press, 1982). E.T. Leeds, A corpus of early Anglo-Saxon (Oxford, Clarendon Press, 1949). J. Hines, A new corpus of Anglo-Saxon Great Square-Headed Brooches (Woodbridge, Boydell for the Society of Antiquaries of London, 1997). R.A. Smith, A guide to the Anglo-Saxon and Foreign Teutonic Antiquities (London, British Museum, 1923). Cite this page as: The British Museum, "Brooch from Chessell Down," in Smarthistory, March 1, 2017, accessed April 21, 2019, https://smarthistory.org/great-square-headed-brooch-from-chessell-down/.